OK, we're not quite there yet, but if I don't get some motivation pretty soon, I might have to get out the old chisel and start working on this headstone. I'd sorely miss the Random Thursday posts! For what it's worth, I'd miss you too. Even if I do see you on FB. I know of wherefor you speak. Streams was much neglected anyway, but my photo blog was actively updated. But now with FB it's harder to keep up with photos too. Sad. I'm sure this is the same thing my Grandmother faced when radio replaced the family reading hour. I started to argue that this isn't an issue of technology, but decided that you're not really making that case anyway. Your analogy is pretty insightful (I know; who'd have guessed? ;-): it's all about changing social interactions. In your example, your Grandmother looked forward to the involvement of the "reading hour," but her family was getting its social stimulus elsewhere. Les, FB is like standing in the middle of a cocktail party where you catch (or throw) snippets of conversation. If you're in the mood for it, it can be a lot of fun – addictive, even – and also a way to stay in touch with family and friends. But it's not designed for in-depth dialogue. Of course, "in-depth" is not exactly the Gazette's forte either, but that's not the point. Anyway, thanks for continuing to visit...I'll do my best to stay the course and try to earn that loyalty! Say it isn't so. There's a place for good bloggers even with Facebook. Maybe the Reporter-Telegram can help bring attention to those good bloggers in Midland. I have no idea what a reference to "good bloggers" has to do with the Gazette, but, whatever. OK...you asked for it. Tune in tomorrow for a hard-hitting exposé of the seamier side of men's fashion, courtesy of the industrious pixel gnomes employed at sub-market prices by the Gazette. No, no.....I can't access Facebook at work!! Besides, I've decided to avoid that particular "social" network when I realized my "friends" weren't realy "friends". 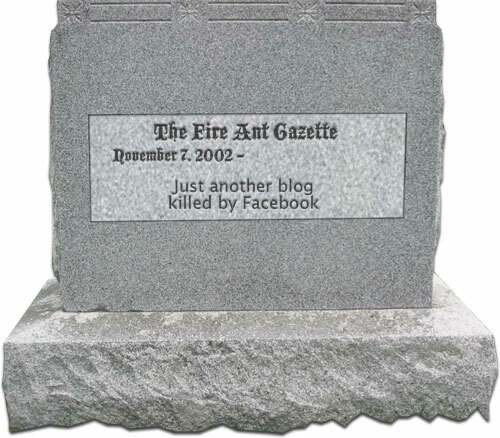 What kind of sick world is this where Facebook is blocked but access to the Fire Ant Gazette is granted? Anyway, you'll always be welcome here at the Gazette, for however long it continues (but comments such as yours are like injections of adrenaline into a cardiac arrest patient's chest...they provide renewed vigor and hope!). Boo! No, don't do it! OK, Gene, I'll try to keep it hanging on, if for no other reason than it gives me another excuse to play around with Photoshop! We'll take you anyway we can get you but I do enjoy your Gazette blogs, plus I drink from the Gazette cup every morning! Uh, oh. You identified the real reason I blog: to sell those Fire Ant coffee mugs! I've made literally dozens of dollars (or I will if I can sell five or six more of them *hint, hint*) from the Gazette CafePress store. They make wonderful Christmas gifts, and will be treasured for years as family heirlooms. You're always on the cutting edge, and maybe that's at least part of what drives you to move on. But what will replace Facebook? I hope the Gazette sticks around, but damn, that sure is a nice tombstone! Cutting edge? Me? Well, anyway...I don't think FB represents an advance over blogging. It"s more an alternative track, a fork in the road. It just takes extra motivation and focus to stay on both paths simultaneously. Glad you like the headstone. I wasn't totally happy with it, but it turned out OK. This page contains a single entry by Eric published on November 30, 2010 8:49 AM. Using Actors In Place of the Real Thing was the previous entry in this blog. Suit Surgery is the next entry in this blog.